Some months ago, I was at a party where one attendee lamented not living in Northern Virginia and having to drive back home all the way to Centreville. This led to an animated discussion about whether that town was part of NoVA and what constituted the region. I started to wonder if it’s possible to come up with a unified definition to end the arguments once and for all. I created a Google Forms survey where I gave people a list of 50 places in Virginia, ranging all the way from Arlington to Ashburn to Richmond and asked them if they considered each one part of “NoVA”. I also gave them the option to include their ZIP Code so I could analyze the data by the respondent’s location. Not visible: Winchester (7.1%), Front Royal (10.4%), Strasburg (2.1%), Stafford (14.9%), Culpeper (5.7%), Fredericksburg (9.6%), King George (2.8%), Spotsylvania (2.6%), Charlottesville (2.4%), Richmond (1.4%). Click for a full-sized version. If one were to go by majority rule, the border of Northern Virginia would run from Woodbridge to Manassas, along the Fairfax County border to Dulles Airport, and then northwestward to Leesburg. There’s an over 20 percentage point dropoff from those places to anywhere outside that boundary. Overall, it would be a fairly reasonable definition, with the exception of perhaps including South Riding to make the border look prettier. 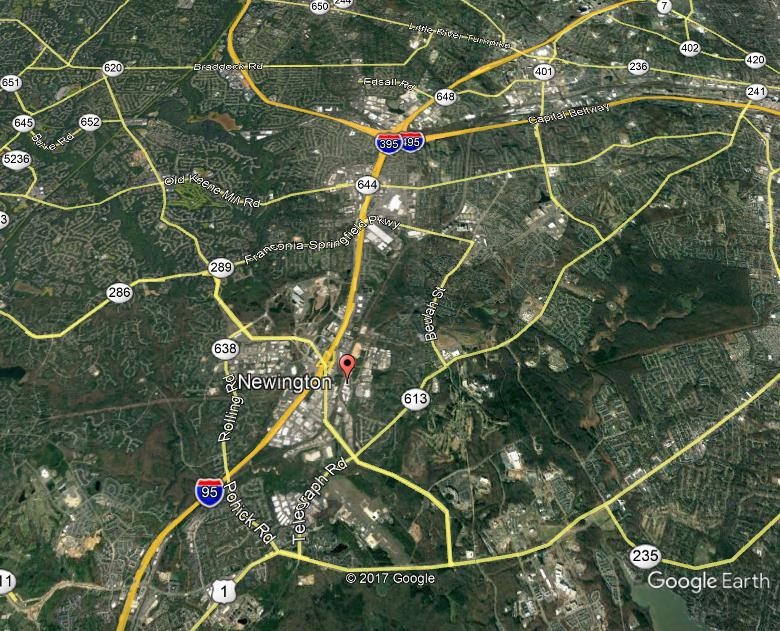 The consensus boundary of Northern Virginia. Apologies for the MSPaint quality. According to the Office of Management and Budget, the Washington Metropolitan Statistical Area contains Front Royal (10% NoVA), Warrenton (11%), Fredericksburg (9.6%), and even Spotsylvania (2.6%). Fewer than one percent of respondents included all four of those places. While those towns may not feel like a part of Northern Virginia, they still contribute to the region. Residents of Fauquier, Spotsylvania, and Stafford Counties all have longer average commute times than those in Fairfax County as people move further and further away from DC. On the other hand, I have heard people who claim that Northern Virginia only consists of land within the Beltway. Despite that, the most frequently-included place was the City of Fairfax, a good five miles away from the proposed demarcation. Reston, even further out, was considered NoVA by over 95% of respondents. 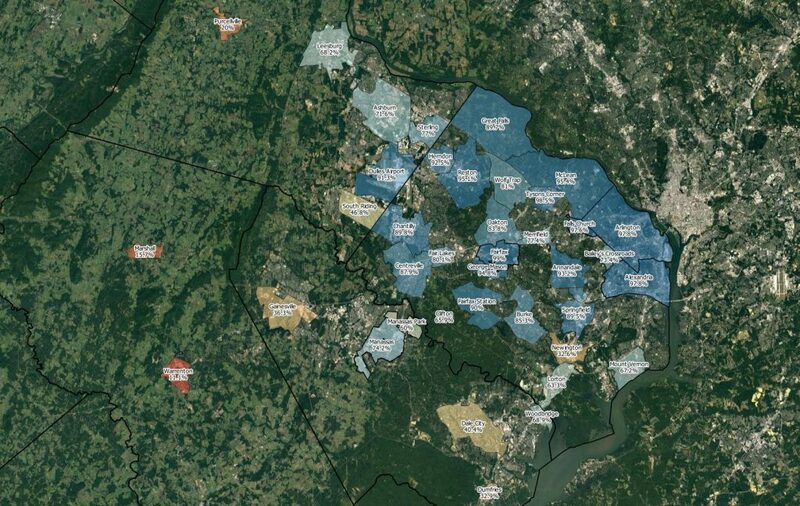 Going by the survey results and population density data, one could argue for a restrictive definition of the area that contains McLean, Tyson’s Corner, Vienna, Fairfax, Burke, Springfield, and points closer. Why is a place part of Northern Virginia? Distance from Washington, DC. This was the most obvious factor, and to no one’s surprise it’s the most influential. About 70% of the results could be explained by this single variable. If it’s within Fairfax County. Even accounting for the above, there’s a noticeable drop once you leave the county. A lot of people I’ve talked to are inclined to include all of Fairfax County regardless of what other criteria was used, so this was somewhat expected. Latitude. After all, it’s called Northern Virginia. This variable probably earned its significance due to places like Leesburg (68%) and Ashburn (72%) being commonly included while Dale City (40%) and Dumfries (33%) were not. Population. There are two explanations for this. The first is that smaller communities such as Clifton (66%) would feel less built-up and therefore not considered to be a true part of Northern Virginia. Secondly, if a place is small, it’s less likely that someone has heard of it, which would cause them to not include it in their list. Newington? Never even heard of it! Newington is a census-designated place located about halfway between the Beltway and the Prince William County line and is closer to DC than Fairfax City. About 13,000 people live within its borders, and it has a respectable 2800 people per square mile. Yet, just under a third of respondents considered it to be part of Northern Virginia. The problem is that few people have heard of such a place. The only time I’ve seen it mentioned with any regularity is the exit sign for it while driving down I-95. I don’t know of anyone who says they’re from Newington, there are no attractions in Newington that I know of, and if I were to talk about that location I’d be more likely to use something like “south of Springfield” or “near Lorton” instead. Several other places ran into the issue of name recognition. Bailey’s Crossroads, adjacent to both Arlington and Alexandria and the densest place surveyed, was selected by only 73% of people. However, if we just consider those who live inside the Beltway, that number jumps to 92%. Woodbridge is at 69% while a couple miles down the road Dale City lies at just 40%. I suspect that number might be higher had I instead asked about the latter’s most defining feature, Potomac Mills. We’re part of Northern Virginia too! Unsurprisingly, people who were from the outer suburbs were significantly more generous with their definition of Northern Virginia than those who lived within Fairfax County. Those residing in Loudoun or Prince William Counties included on average four more locations as than those within the Beltway. This is even more evident when we focus on the further-out towns. While those in Loudoun County are more willing to include themselves in Northern Virginia, they don’t tend to extend the same courtesy to those in Prince William County (and vice versa). Gainesville, South Riding, and Aldie are notable exceptions, due to them all being closer to the county line than, for example, Purcellville or Woodbridge. Can a gas station settle this once and for all? Sheetz is a chain of gas stations with locations ranging from North Carolina to Pennsylvania and Ohio. Similar to Wawa, they pride themselves on serving “made to order” food, which earns them their popularity during college student road trips, having spoken from experience. They also don’t have a single location inside Fairfax County. In fact, the nearest Sheetz locations to DC make for a rather accurate frontier of Northern Virginia. The one exception to this rule is the Sheetz between Sterling (77%) and Dulles Airport (91%). Oddly enough, when I zoomed in on that location, it did not appear to exist. I’m just going to assume that there was a glitch in Google Earth and that location was added in error. There will continue to be disagreements over what defines the exact borders of Northern Virginia. If we were to extrapolate our findings, we could say that over 100,000 people in the area would include Fredericksburg while another 100,000 would leave out Springfield (and 10,000 would do both, apparently). However, there is still a fairly reasonabe compromise to be found and hopefully we can all agree on it and never have to deal with this argument ever again. Okay, maybe I’m a bit too optimistic. There were 944 total responses, of which 859 entered a local ZIP Code. Aldie was not included on the map or analysis because it’s not a census-designated place. Dulles Airport was excluded from analysis because it has no population. There were no attempts to weight the sample by location, but if that were done responses from Loudoun and Prince William Counties would count about double. There were also no attempts to get a representative sample, and I do not pretend that this is the pinnacle of polling science. It’s unlikely that 2.2% of the population does not believe Arlington or Alexandria are part of Northern Virginia; rather it’s probable that some people misclicked, intentionally trolled the survey, or misunderstood the prompt. I’m looking at you, guy who selected Herndon and nowhere else. Raw data can be found at https://github.com/hdwhite/novastats/. 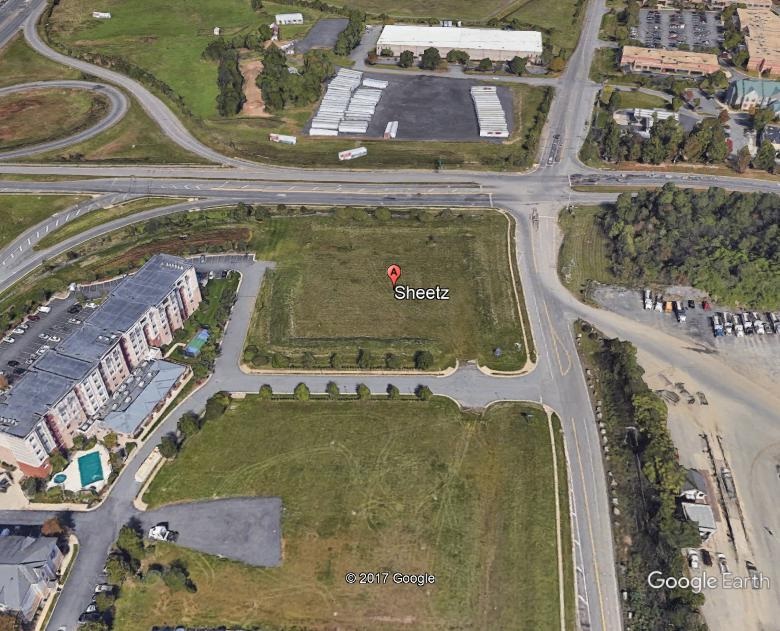 The Sheetz in your picture exists, it’s just brand new and thus was built after the Google Earth picture was taken. I did some research and it turns out it’s a cheap knockoff called Sheets. Really interesting. Funny that Fairfax City ended up with a higher inclusion rate than somewhere like Arlington. I wonder if political affiliation might help to explain a lower inclusion rate in places that I would consider to obviously be NOVA. I suspect that there are folks more toward the conservative end of the spectrum who prefer to think of themselves as living in, as George Allen put it, “the real world of Virginia” rather than in liberal Northern Virginia. South Riding is still a mystery to me, though. The only thing I can think of is that a lot of respondents hadn’t heard of it and the word “South” in the name colored their opinion. Oh, as for the Sterling Sheetz, it’s brand new, just opened in June. Here’s a Tweet about their grand opening: https://twitter.com/sheetz/status/872840804372545536. Google likely just hasn’t updated their satellite imagery yet. 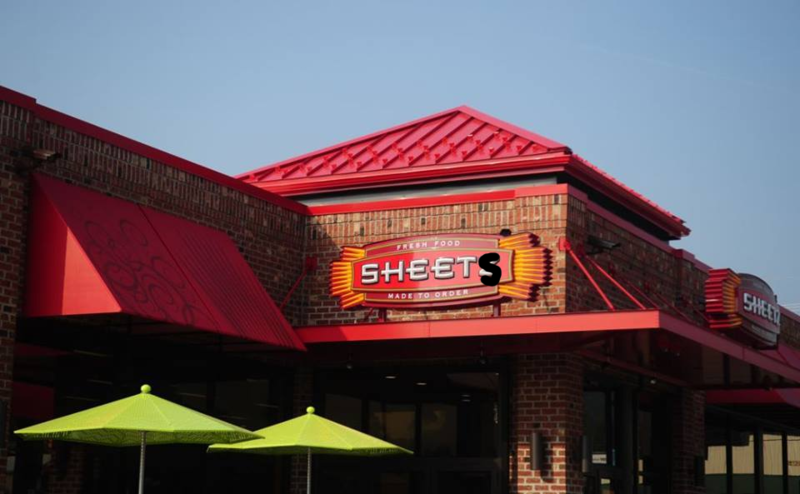 There is also a sheetz in South riding and a few in Manassas. The Democratic primary doesn’t show a difference between NoVA and it’s neighbors. Also, that Sheetz that doesn’t exist in your picture, is across the street from a Wawa that doesn’t in that GoogleEarth picture, either.